There comes a time during every Steam sale when you have to get serious about your gaming future. You have to look hard at the remaining deals and decide whether you want to be one of the winners who bought Farming Simulator 2013 for $15, or one of the chumps still puttering around with a 2011 edition and its positively ancient combine harvesters. 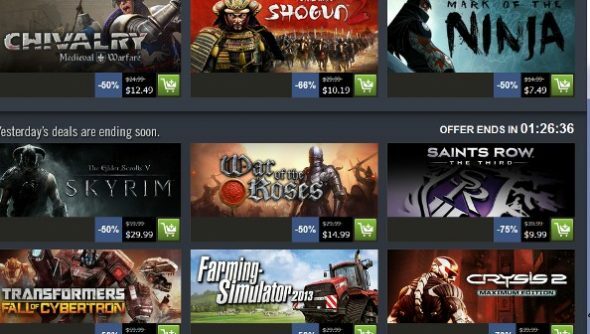 As always, keep our Steam sale tips close to your heart as your contemplate the discounts before you. This is no time to over-spend on a mediocre deal when there are real bargains to be had. For instance, the alert steam shopper will notice that 1…2…3… Kick It! is “on sale” for a 0% discount. Pretty sneaky, Steam. Rob: There’s a lot of things that leave me cold about Skyrim besides the icy northern weather, but when I think back on the game, what I remember the most are long walks beneath the northern lights, or climbing a mountain in the middle of a blinding snowstorm, or cresting a ridge and seeing a gorgeous valley unfurl below me. For memories like that, I’ll forgive clunky combat and paper-tiger dragons. I’m not wild about this price, but it’s at least worth considering. Jeremy: If you’ve a hankering for first-person stealth post-Dishonored, get this, invest in the ‘Calm’ spell and make a beeline for the thieve’s guild in Riften. Before you know it you’ll be burning beehives in thug-reinforced breweries, cackling into the moon after another non-lethal night’s work lifting others’ belongings. Rob: This is a game where nobody ever said, “No.” The result is one of the most joyfully uninhibited action games I’ve ever played, with creative missions and hysterically funny characters. I liked my crew of oddball gangsters and their deeply crazy enemies, and I loved doing things like teaching myself fearlessness by driving an angry tiger around in a convertible. Tim: None of us have played it. But metacritic thinks it’s 79% good. Rob: Noobs need not apply. Tim: I didn’t enjoy this one bit. It didn’t do the thing I loved Crysis 1 for: giving you a ludicrous open space, a bunch of toys, and an army of bads between you and the door home. And the enemies were terrible: ludicrous dreadlocked alien things that I couldn’t even be bothered to out-think. Tim: It’s alright I suppose. I’m always slightly confused by the love for Borderlands. I think it’s probably best when you’re playing it in the perfect setting: with a friend who’ll play through it with you from start to finish. I’ve found that improvised co-op – when you join mates of differing levels, is a bit of a disaster. Seems like an obvious thing they’d have fixed between the games. Rob: This is the best F1 simulator around, but if you own last year’s edition, this might still not be enough to tempt you. With that said, the handling feedback feels more precise than ever, making it easier to find the edge of performance with these cars, and it also seems more impossibly beautiful than ever before. Plus, this year you can try the amazing new Circuit of the Americas track in Austin, Texas. Rob: At this price, you’d be a fool to pass on Deus Ex: Human Revolution. Don’t let whining about the boss battles fool you: they only stick out because so much of the rest of the game is so good. It’s stylish and atmospheric, and while Human Revolution may not have the most advanced stealth mechanics or the best combat, it remains a terrific adventure. Tim: I thought this was a triumph. Stunning. Buy, basically. Rob: This marks Total War’s definitive return to greatness following a lackluster with ambitious but badly flawed games like Medieval 2 and Empire. Shogun 2 is hauntingly beautiful and mercilessly demanding: the AI may not be imaginative or error free, but it puts up a good fight in every battle and will demand inspired generalship to defeat. I recommend, in this case, springing for the Shogun 2 Collection for $12.49. The additional content is cheap and well worth a look. Tim: Aye. It is good. Rob: This is one of my favorite games of this year, an effortless and elegant stealth platformer that encourages both virtuoso execution but does not overly punish mistakes. No sooner will you finish one playthrough that you’re thinking about the next, and how to accomplish the special objectives you missed the first time around. Tim: Top down 2D bullet hell shooter thing set in a version of the American Civil War that alsop has Martians. It’s a little slight – I think it could do with half as many levels again. But it’s cheap as chips. Worth a punt. Rob: This is probably as close as you can get to WW2 short of a time machine. With adjustable sights, realistic ballistics, and an unforgiving and lethal battlefield, Red Orchestra 2 simulates the life of the unlucky foot-soldier on the Eastern Front. The payoff is that no shooter has ever made me feel such a surge of pride and accomplishment when I successfully take out an enemy. Every good shot, every clean kill is the product of careful planning and great execution. Jeremy: Buy Braid now, and forget about it. It’s okay. I did the same a couple of years ago before picked casually at it over Christmas. Never before or since has a game overheated my brain. And more’s the pity, because I liked it. It’s a 2D side-on flying combat game: think the original Mario Bros. but with aeroplanes and guns, rather than two plumbers. They spent a lot of time thinking about perks and bonuses for levelling up through play: there’s a deep Call of Duty style progression system. Kind of brilliant for LAN parties actually.